If you want something specific (Aqua Affinity, or Respiration) try this site- it helps you find the best level to enchant at for a certain enchantment. Very helpful! Oooh. Thanks, bro! Will look at. Small update (if you can even call it that)! 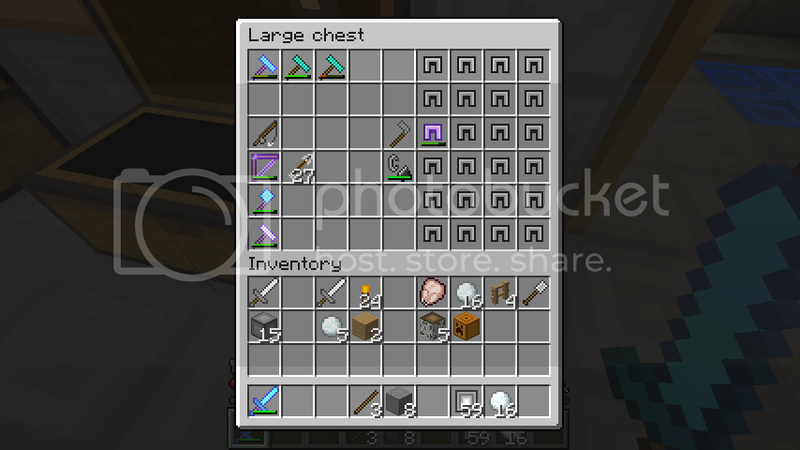 I got bored at my XP farm, so I went exploring. =P Haha. Desert wells looks really awesome with the lighting glitch going on. 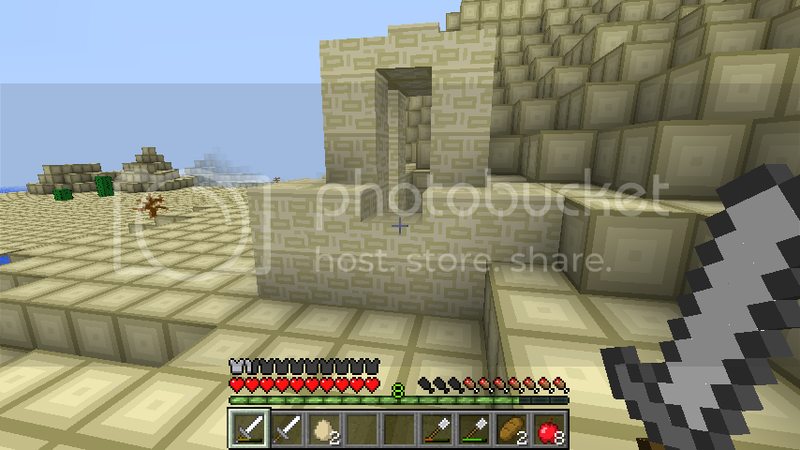 And here's another desert well on the other side of that same desert. 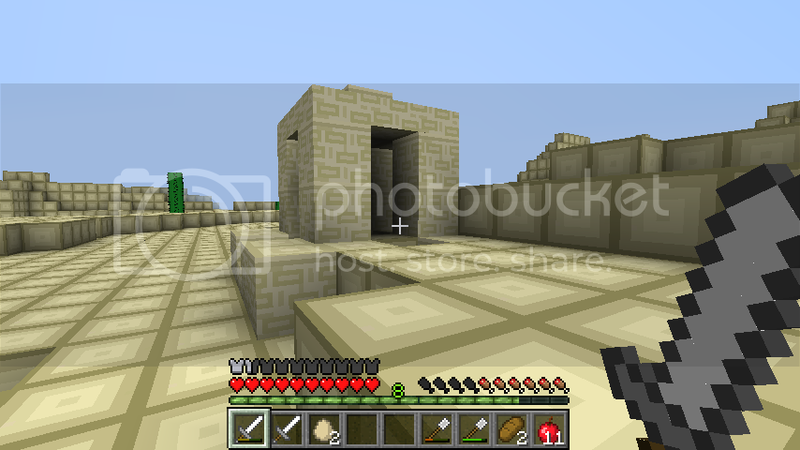 Couldn't find a village anywhere, though, which is surprising considering there's two desert wells, but whatevs. Haha. And another random pumpkin. I decided to get it just because. I really like that silhouette! I barely noticed it til I read that. Ooh, very nice. Too bad you didn't find a village. The desert wells look cool but they are so pointless since there's little mini ponds all over the place. I agree with the sunset being lovely. 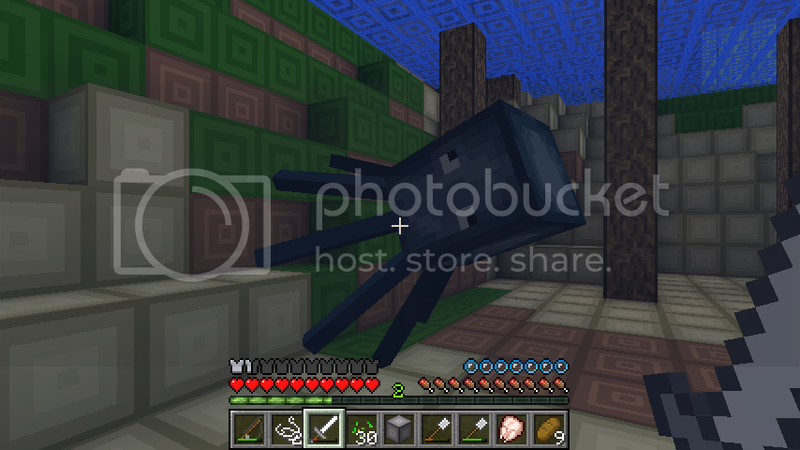 Minecraft is visually stunning in its own peculiar way. I always seem to get a chick from an egg when I don't want to. No matter; I decided this could be my pet in my zombie place. Too bad I killed it when I was flinging my sword around. Haha. I can finally hang out with my bros for a really long time! Haha. Not too far from my house, I noticed a hole I've never seen before. I saw two skellies down in it, so I thought maybe there was a skellie spawner down in that beast, so I got prepared to dive into the hole. Just a short ravine. How unexciting. 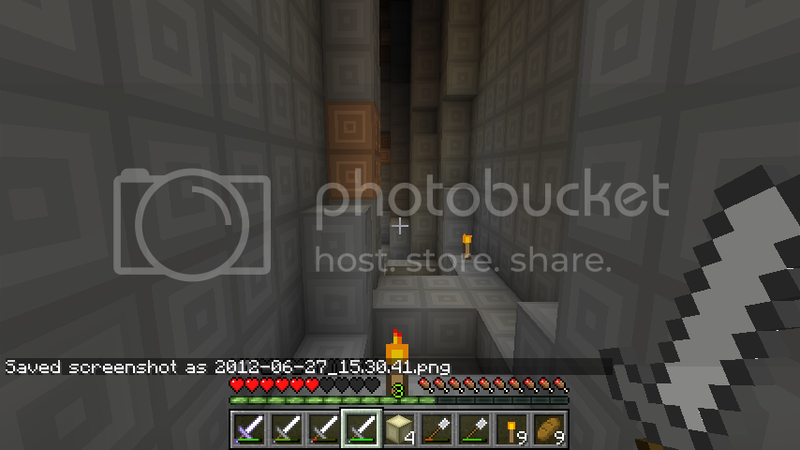 I did encounter three creepers and three skeletons down here, though. The other half of the ravine. I stood still when I took both those pictures, and since you can see the end in both of them, you understand how small it was. Hahaha. 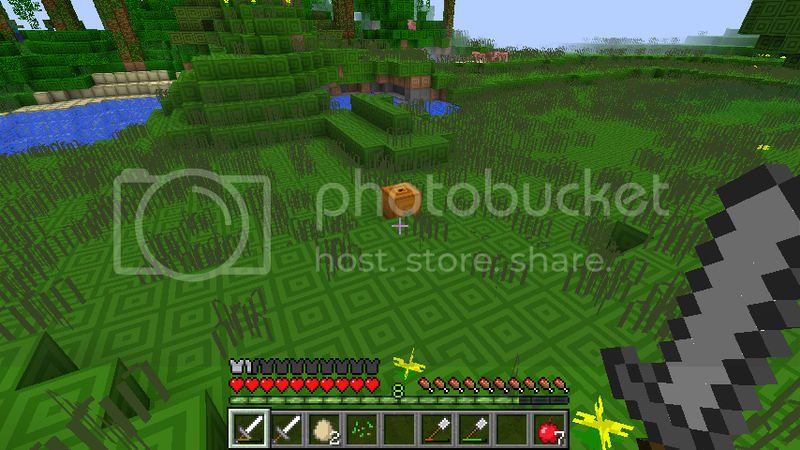 While I was coming back from the ravine, I was sorta cut-off by a skellie and two creepers. 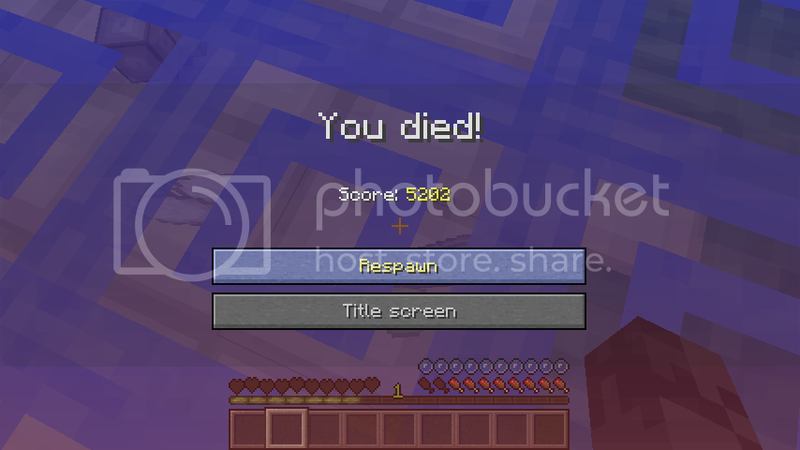 I killed one of the creepers, but since I was so close to the skellie and other creeper, fighting them was hard, to say the least. 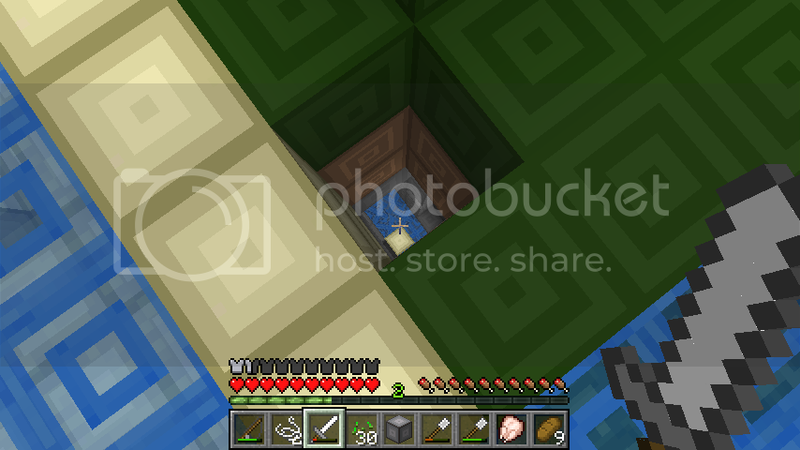 =P And to add to it, once that one creeper exploded, another found its way to me while I was still in the hole. Hahaha. The outcome is pictured above. I have no idea how I didn't die. Ah, creepers. How absolutely annoying. The mini ravine sounds like it was way more trouble than it was worth. Good job not dying with all those creepers about! Yeah, it is a lot swords. Haha. And I don't think I've crafted a new sword or shovel in ages. As soon as I get some melons, I'll consider the health potions! But for now, using swords I get from killing zombies against zombies so I can get more swords seems pretty legit. Haha. 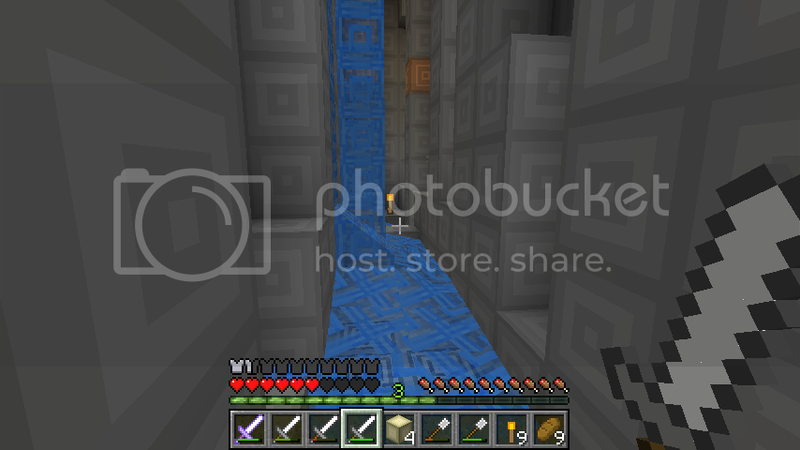 And that ravine was wayyyyy more trouble than it was worth. Especially when it came to getting out of there. =P Couldn't ever find the place I jumped down at, so I just climbed up some random waterfall that just so happened to take me outside at night in a mob infestered swamp. Ha! The rate at which zombies drop stuff is ridiculous, so I"m sure even with using their own swords against them, you still have too many! 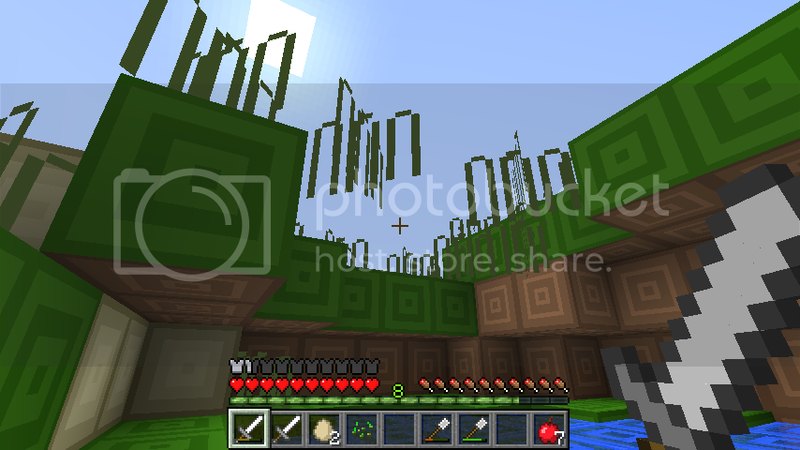 Mob infested swamp, lol. That's not good! I hate the vines, they slow you down when you're sprinting. I know, right? They really drop a ton of helmets for me. I have almost a fourth of a large chest filled with them. Or maybe a third. Somewhere in that number. Haha. No, you have to say it right. "Infestered." Haha. There weren't many vines around, just a little water and a few trees. Luckily I came up near the transition to the forest, but I still have to fight my way through a billion (maybe three) spiders. I got stuck in a chest! Haha. How do you get stuck in a chest?! It's really cool. It's actually not too difficult (Would you believe me if I said that I actually set out to get stuck in a chest? Haha.) 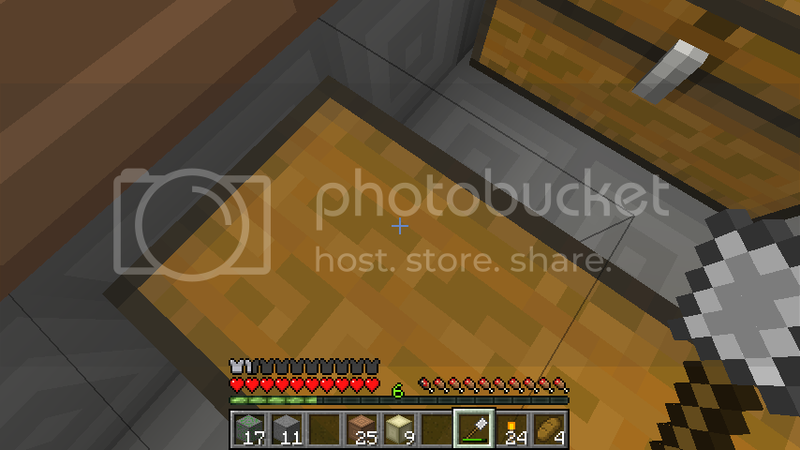 All you have to do is have a chest on a flat surface and a chest beside it a block away. You get on top of one of the chests and sprint off it onto the ground towards the other chest. If done right, you should get (sorta) stuck inside it. Haha. Infestered. Pfft, okay I said it. Do I win anything? Hurray! You win a limo Corvette! An actual update! It's small, though. Awww, poor snow golem. He tried his best. No problem! I have an endless source on this magical item thing called Google. I don't know how it works, but it has everything for free! You should Google it. And yeah. 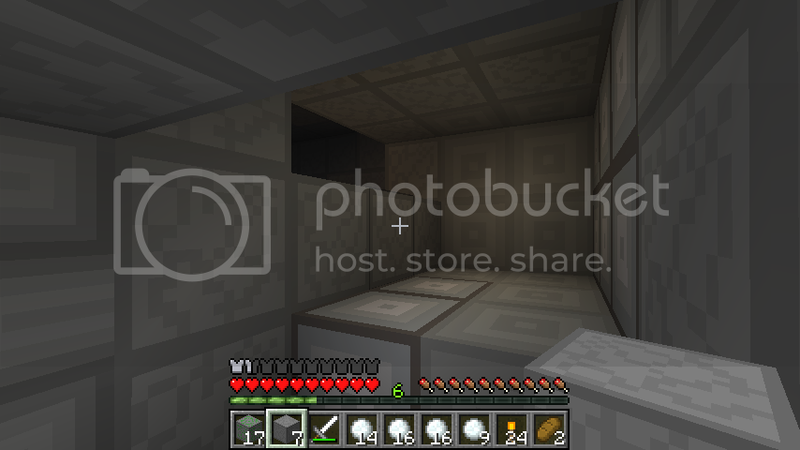 I may put a snow golem on the bottom of the pit for some comedic relief. Google? That's not a word. Did you mean goggles? No, it's called Google; crazy right? Ya see, you type something in and press Search, and then Google will spit junk out at you that matches the search! It blows my mind every time, I swear. So if I use this Giggle thing to search for "a million dollars," a million dollars pops out of my screen, or what? :/ I'm a noob to this innertube, halp? *Sigh. Firstly, the correct term is Goggles, I mean, Google. And yes, of course! If you search "a million dollars" you'll be rich! It's amazing! Don't worry, the blogosphere is pretty easy to navigate once you get Google-ing down. Crazy Awesome (though somewhat small) Update! One of the best swords I've ever had. The Knockback gave me worries when I first got it, but it's growing on me now. Makes it easier to put distance between me and creepers, at least. Haha. And I died again. Haha. Fell into a block high of water. Didn't lose anything since I had no levels, so it's all good. 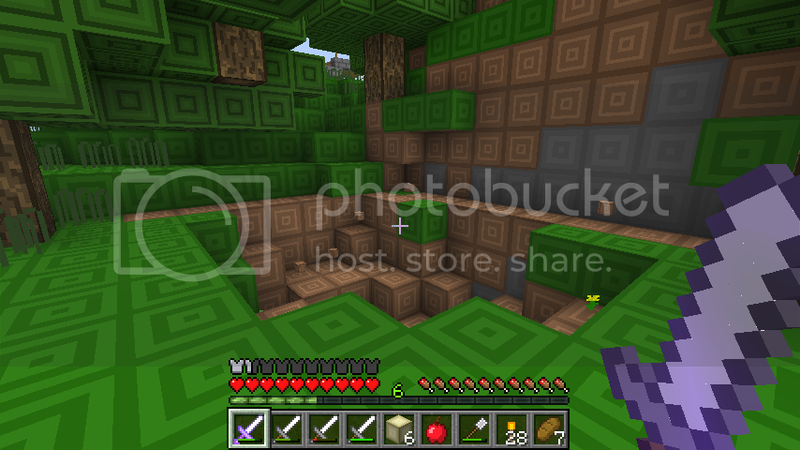 Then I went mob hunting with that nice, new sword of mine and got some pretty cool stuff! All in all, a nice little mob hunting night. I think I got 24 arrows when morning came, around 10 bones, and maybe 18 gunpowder. All my iron helmets. =] Hahaha. Ooh, that's a nice sword you have there. And you got records! Yay for musics. For some reason, the random enchanted helmet makes me lol. Why thank you! 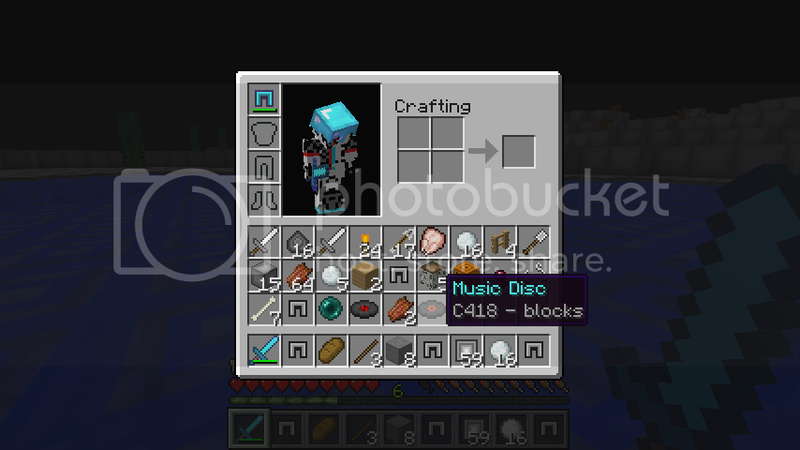 It's one of the few enchants of mine that I think was worth the levels I spent. Besides the Fortune pick. And the Silk Touch pick. And the Fire Aspect sword I got today. 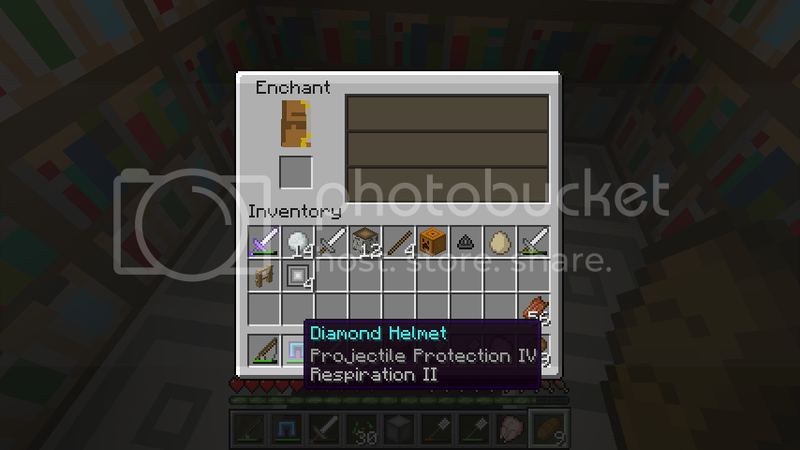 And the diamond helmet. And the iron helmet from several weeks ago. And all the bows. So, I guess the only thing left would be the Bane of Arthropods enchants... Hahaha. Four columns of helmets makes me lol, I'm just saying. Hahaha. And yes, of course! Haha. 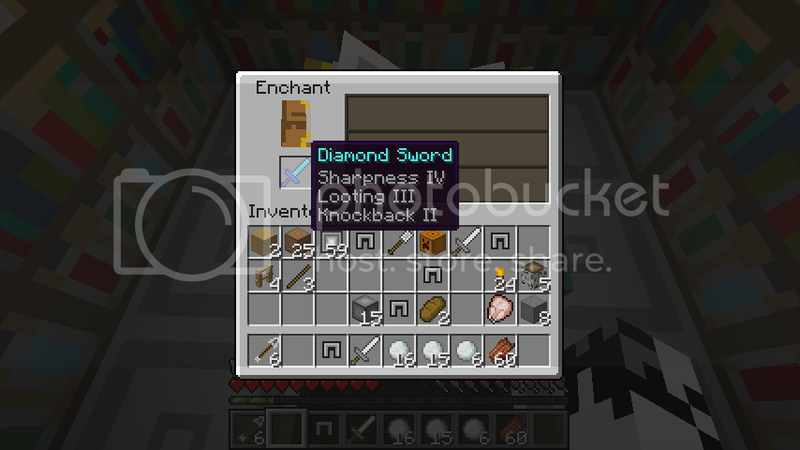 I just got a Fire Aspect I iron sword, so I'll be saving it for those occasions. As for the number of posts per page, I think less might be better for those of us with poorer internet connections or slower computers. I mean if you're keeping up with a thread already there's no reason to scroll through the whole thing over and over again anyway. You just click on the latest post. It's what I do.